After the successful pilot last year in Delft, Rotterdam is now also using its public chargers to improve AED accessibility. Amsterdam, April 9th 2019 - Since this week five more AED-equipped electric vehicle charging stations have been installed in the Netherlands. Following the successful pilot last year in Delft, the city of Rotterdam has now also upgraded five of its public charging stations to include an AED (Automated External Defibrillator). Yesterday the stations were revealed in the presence of Rotterdam officials, EVBox, City AED, Dutch Heart Foundation and local press. Many AEDs are currently still located inside buildings, limiting access to them especially outside of business hours. This was why City AED decided to take action last year by equipping EVBox's public charging stations with AEDs, to improve the national AED coverage and allow first-aid helpers easier and quicker access. 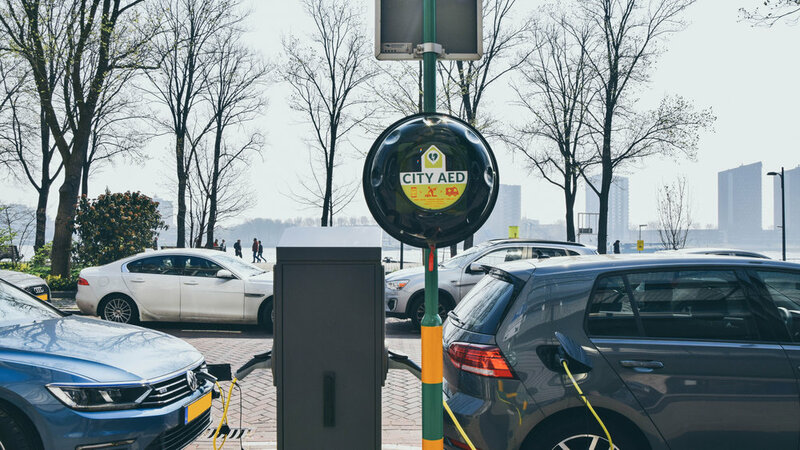 After positive feedback from the pilot in Delft, other cities (including Rotterdam) are now placing the AED-equipped charging stations across their cities.